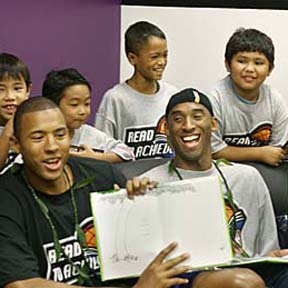 Some members of the Los Angeles Lakers -- including Brian Cook, left, Kobe Bryant and Brian Shaw -- were on hand yesterday to help dedicate the new Lakers Reading Room at the Boys & Girls Club of Hawaii in Moiliili. Oahu gas prices could go below $3 next week as recent decreases in mainland oil markets get factored into the weekly gasoline price caps set by the state. Hawaii companies are looking for holiday-season hires on top of the workers they already can't find. Many employers facing a tight labor market are trying new recruitment tactics or have sweetened the pot to lure and keep workers. While UH's Colt Brennan's penchant for scrambling has him second on the team in rushing yards this season, it also means the offensive line has had to work longer to protect him at times. But the Warrior linemen don't seem to mind. Some 6,400 people will converge on the Hawaii Convention Center Nov. 13-16 for an annual U.S. employee benefits conference. The number of public school students lacking English language skills is growing rapidly.